The extensive development of the S-Line ionizing bar EI SL offers many advantages, especially to the application technology. Modern tailor-made industrial design: The round construction of the ionizing bar, in combination with the special HAUG bar holders, permits the exact axial adjustment to the material web. 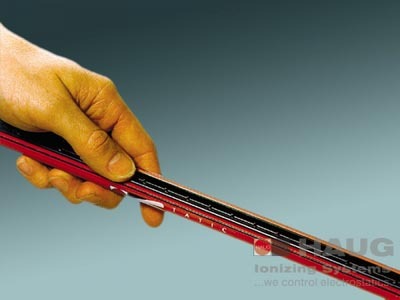 The ionizing bar so always offers the optimal amount of positive and negative ions to the material to be neutralized. Tailor-made technology: The outstanding HAUG engineering technology stands for high quality. This technology prevents disturbances as well as loss of production and produces a considerable saving of both time and expenses over the medium term. Tailor-made accessories: The HAUG System X-2000 coaxial high-voltage plug-and-socket connection offers unique benefits. The gastight high-voltage plug can be connected to HAUG power packs without tools. The flexible coaxially shielded cable is used to connect the ionizing bar to the voltage supply source. Today, HAUG ionizing bars are indispensable to the packaging, film/foil, printing and textile industries as well as for many other industrial applications. The EI SL ionizing bar is suitable for feed speeds of ≤100 m/min. In order to ensure high efficiency and trouble-free production, we recommend that two ionizing bars be installed (above and below the material web), particularly during foil processing.